After the implementation of the energy efficiency design index (EEDI) for environmental conservation, we began development of a propeller with the smallest blade area. We offer products that maximise propulsion efficiency with energy-saving devices installed in front of and behind the propeller. Nakashima Advanced virtual Tank 5000: Nakashima Propeller has large-scale computational fluid dynamics (CFD) systems with 5000 cores, named the NAT5000. 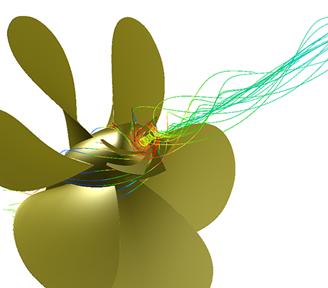 To design specialised propellers with the small blade areas required for fuel efficiency, high-precision and rapidly computed cavitation predictions are indispensable. Therefore, we use the 5000-core system to compute cavitation models and achieve high-speed and high-performance designs. In addition, the NAT5000 is also used in the design process for energy-saving optimisation. Although many companies invest time and money into prototype model-scale tests, we use large-scale CFD to verify energy-saving effects at full scale. If we have one million vessels to provide propellers for, we will develop one million propeller designs. We believe that the appropriate propeller requires consideration of the entire vessel. Therefore, we never mass-produce our propellers. 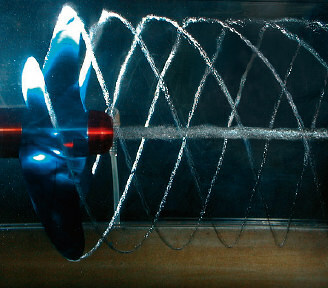 Propellers installed on the types of vessels do not have the same profile because different wake distributions affect the cavitation performance. Therefore, we recognise the need for precise and delicate technologies that can increase the efficiency by even 0.1%. Such custom-made designing is a synonym for our high quality and the essence to achieve the best performance. Development of small-blade-area propellers and Non-Hub Vortex (NHV) propellers has proceeded in collaboration with national projects. As part of the Green House Gas Reduction Project led by the Ministry of Land, Infrastructure, Transport and Tourism, Nakashima Propeller conducted joint research on NHV propellers with small blade areas. We reduced frictional drag by reducing the blade area, and we have succeeded in improving the efficiency using NHV technologies to recover energy loss from propeller hub vortices. The effectiveness of a propeller with minimal blade area has been demonstrated not only in calculation and model tests but also in the actual vessels. In the actual vessel tests with chemical tankers, our propellers have achieved energy savings of 4.5%. Reduction in the propeller deployment area leads to increased cavitation, so restraint and stabilisation the volume of cavitation are both important factors in propeller designs that have small blade areas. We have found in repeated studies that the occurrence of cavitation is suppressed by adding a rake to the tip of the propeller blades. This tip rake reduces the erosion risk and reduces fluctuations in pressure. 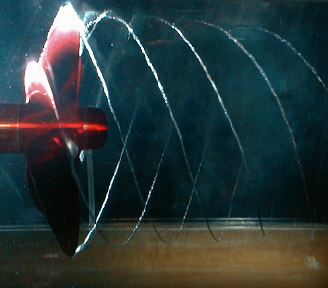 Tip rakes improve cavitation suppression while the blade area is narrowed to the limit. An efficiency improvement of 8.7% is possible with a combination of energy-saving devices. The energy-saving devices developed by Nakashima Propeller take into consideration the whole system of the ship propulsion components. In fact, in combination tests using 82BC model vessels conducted in cooperation with the National Maritime Research Institute, the combination of a Neighbor Duct and Ultimate Rudder Bulb resulted in an energy-saving effect of 8.7%, and the combination of Neighbor Duct and ECO-Cap reduced fuel consumption by 6.2%. In response to customer requests, we can select eligible energy-saving devices that can reduce fuel costs, and we can prepare a detailed proposal that quantifies the expected savings from a certain amount of initial investment. The ECO-Cap is designed to prevent vortices that originate at the roots of the blades of the propeller from concentrating at the end of the cap. The device suppresses the generation of a negative pressure region at the rear of the cap and reduces the resistance at the rear end of the cap, thereby improving energy efficiency. Although the cap body is made of NAB, the fins are made of FRP, and the fins have low resistance because of the thin blades. In addition, the number of fins is 7, and by shifting the phase with propeller blades, we can accommodate a wide range of fluctuating flows such as different ship speeds, revolution speeds and rough weather. 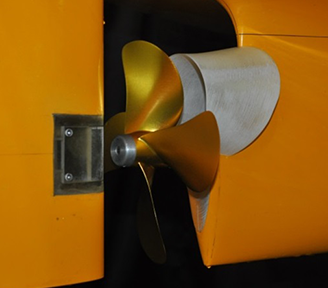 The concept of development of rudder bulb is "ultimately" close bulb head to propeller. The cap portion of the propeller takes the form of a bulb head, and it is arranged to form a single streamlined bulb shape in combination with the bulb body on the rudder side. We conducted model tests with various types of vessels used for low-speed and high-speed applications and found that this bulb head mainly improves the thrust deduction factor. This structure improves energy efficiency by 2% to 6%. The Neighbor Duct is attached to the stern and generates extra thrust by utilising the energy of the flow on the side of the hull. To make available as much flow as possible, the structure has a long and elliptical shape in the vertical direction along the hull. The duct is located at "neighbor" of hull, so we named it Neighbor Duct. The self-propulsion tests using 82BC model vessels conducted in cooperation with the National Maritime Research Institute have shown these ducts to yield a 4.6% boost in efficiency. In particular, the thrust deduction factor was greatly improved to 2.7%, which confirms that the generation of thrust by the Neighbor Duct was very effective. 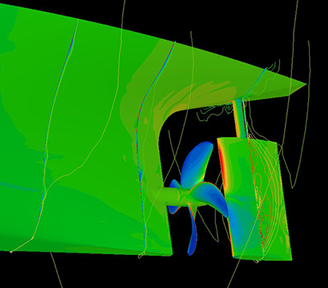 Results of model tests and actual ship tests with high-performance propellers and energy-saving devices have been summarised in peer-reviewed technical papers.